The neighborhood is hosting a clean-up event in conjunction with our quarterly meeting on April 20th. We’ll begin the morning at Southminster Presbyterian Church at the corner of Harding and Danby. Coffee and donuts will be available at 9:30. After a few brief announcements and distribution of street assignments, we’ll head out into our neighborhood to pick up litter. Metro Beautification will provide gloves, trash bags, and grabbers. We’ll meet back at the church to return supplies. April 12 • Brief Power Outage as NES replaces meters. Important Date Change: We are postponing our regular quarterly meeting from Saturday, January 19, 2019 to Monday evening, January 28, 2019, at 6:30 pm. We will be meeting at Norman Binkley School. This change was necessary to accommodate Mayor Briley's schedule. As it turns out Governor Lee's inauguration falls on our Saturday meeting day and he was expected to be there. We believed this was a meeting worth accommodating for our neighbors in Caldwell Abbay Hall NA. Mayor Briley is interested in hearing from Nashville's residents about the budget. He would like input about what residents believe are important and want included in the budget. The mayor's staff will be taking notes as we share our thoughts about the budget and other concerns we may have regarding the city and city services. Please wear your CAHNA shirts if you have one. Let's show Mayor Briley our neighborhood pride! CAHNA will provide light snacks and drinks. Please RSVP on the Nextdoor calendar so we can have an idea of how much food to provide. I look forward to seeing everyone on Monday, January 28, 2019, at 6:30 pm at Norman Binkley Elementary School. We are collecting sock and underwear for the students sizes (3yr - 11yr) . We are also collecting ($10, $15, $20, etc) Wal-mart giftcards. May - August • Thursdays 4:30 - 7:30 Farmin in the Hall. Crievewood United Methodist Church 451 Hogan Rd. Brush Collection begins for area 6. Please have any brush by the side of the road before 7 am the first day of collection. Metro will only make one pick up during this time. Next Collection will be in the three months. More Details on Brush Collection. Recycling pick up for the Caldwell-Abbay Hall area is the fourth Wednesday of every month. Place your Green Cart on the curb by 7 am on the day of pick up. Caldwell-Abbay Hall means: Beautiful homes and active neighbors. Our regular meetings are at the Southminister Presbyterian Church on Harding and Danby. At 10:00 am on the third Saturday of each new quarter. Dec 20 • Brush removal begins. Since Brush pick up is before Christmas there are options to keep the neighbor hood clean. Dec 27 - Feb 16 • Metro Christmas tree drop off. 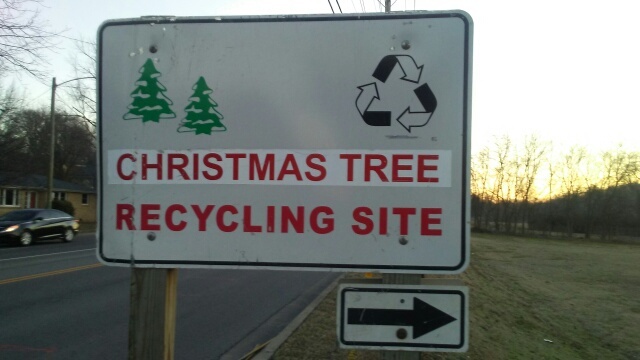 You can drop your Christmas tree off at selected Metro parks. Christmas tree drop off. The nearest location to Caldwell Abbay Hall is Whitfield Park at 5101 Edmondson Pike, near the Library. Dec 31, Jan 1, or Jan 6 • Support Hillsboro High Band and have them pick up your Christmas Tree. Tree Pick-up. Go to their site, donate to the band, pick a date, place clen tree on crub. You need to have the tree on your crub by 10am on the date of pick-up. .
Oct 21 • CAHNA Meeting and Gratefull & Giving Potluck Breakfast. We are collecting sock and underwear for the students sizes (3 yr- 11 yr) . We are also collecting $5, $10, and $15 Wal-mart giftcards. There will also be tours of the school. Weekends • Boo at The Zoo. Thursday - Sunday nights (5pm-9pm) $13-$16. Sept 30 • Nashville Neighborhood Celebration Fifth annual Neighboorhood Celebration Elizabeth Park Neighborhood. August 4, 11, 18, 25 • Safari Fridays at Nashville Zoo. July 7, 14, 21, 28 • Safari Fridays at Nashville Zoo. May 4-6 • Norman Binkley 3rd and 4th graders present Alladin. You can purchase tickets in the front office of the school between 8:30 and 2:30. Some tickets will be available at the door. Tickets are $5 for adults and $3 for children under 12. May 20th • 9am-4pm Urban Gardening Festival at Ellington Agricultural Center. 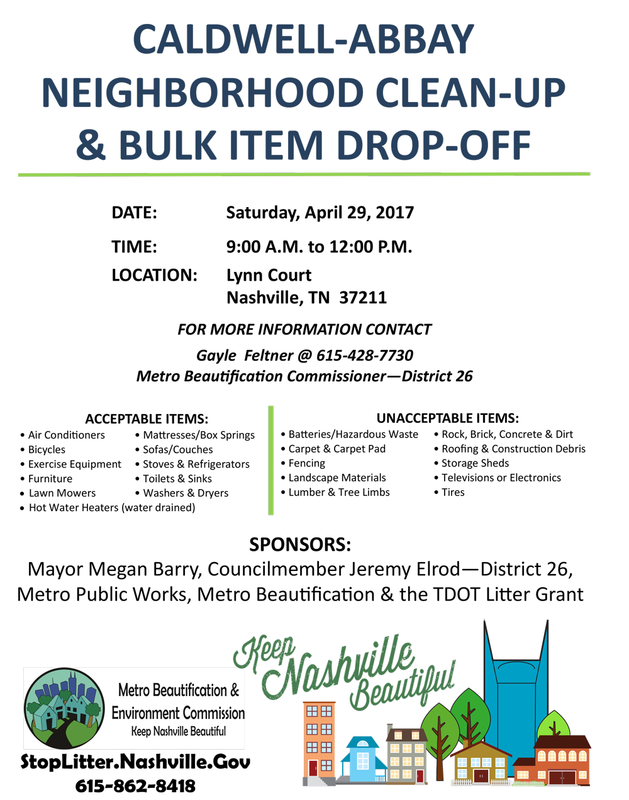 April 29 • Neighborhood Clean up and Bulk item Drop off. Bring selected items for pick up by metro. Lynn court 9-12. PRE-SALE PRICES: $7 for adults. $5 for children. Come by the office to complete an order form and purchase your tickets! A limited number of tickets will be available at the door the night of the event. ($8/adults and $6/children) Please come out and support our PTA as they help support the students of Norman Binkley Elementary! Jan 21 • Neighborhood Association Meeting and Potluck Breakfast. There will be a community meeting with representatives from Nashville/Davidson County Property Assessors office to explain State mandated property reappraisal for Jan. 1, 2017 These meetings will be conducted to help the public understand the reappraisal purpose and to inform them of deadlines for reviews and appeals. December 22 • Brush collection. December 7 7PM • Zoning Overlay Meeting. Should Caldwell-Abbay Hall enact zoning restictions? November Holiday Lights contest full details at Nashville.gov. Deadline to enter Nov 27. All lights must be on by 6:00 PM from November 28 - December 6, 2016 for judging. November 8th • Election Day 7AM-7PM. Polling place is Norman Binkley Elementary School. Oct 19 - Nov 3 • Early voting. Election day is Nov 8. Oct 27-30 • Boo at the Zoo. Oct 21-23 • Boo at the Zoo. Oct 15 • Neighborhood Association Meeting and Grateful & Giving Benefit for Norman Binkley ES. Oct 14-16 • Boo at the Zoo. October 1, 2016 will be Nashville's first Fall Green & Clean event! We need you to help Keep Nashville Beautiful by organizing a clean-up or planting event in your neighborhood! Free event, Scarritt Bennett Center Kids zone, Chili Cook-off and tasting, Battle of the Neighborhood Bands, Neighborhood Showcase, and Neighborhood Salon. Click for more information. Support your neighborhood and compete to win money for our organization. Last year we won the chili cook off! September 22 Brush collection begins. Wauford Drive between Harding Place and Danby Drive in the vicinity of Norman Binkley School. We need your support. Please join us for the rally to bring attention to this important issue. Aug 25 • Final Day of Farmin In The Hall, last day to get local produce in the neighborhood. One weekend earlier this year! Pay no sales tax on clothing or school supplies under $100 per item. No sales tax on Computer under $1500. Full details on TN sales Tax Holiday! July 15 - July 30 • Early voting for Primaries. July 8 • Red, White, and Zoo: wine tasting. June 10 Brush collection begins. May 5 - August 25 • Thursdays 4:30 - 7:30 Farmin in the Hall. Crievewood United Methodist Church 451 Hogan Rd. May 27 • Zoovie night at Nashville Zoo. See the movie Minions on the festival field. We will meet with signs and CAHNA shirts and disperse to some key traffic areas in our neighborhood during the morning rush hour to encourage drivers to slow down and obey traffic laws. Metro Police will be there to support us in our efforts to remind people to drive safely in our neighborhood. See news coverage of the May 9th rally on the Neighborhood Watch Page. May 14 • Neighborhood Yard Sale. Caldwell-Abbay Hall means: Great neighbors who care about each other. Entertainment: Signed Recording Artists, Local Talent, Children’s Fun Zone, Food, Beverages, Prizes Give-a-ways, and Much, Much More! July 18 • CAHNA Meeting at Southminister Presbyterian Church. April 18 • CAHNA Meeting at Southminister Presbyterian Church. March 14 • Progressive Dinner. March 12 • Brush Collection. Janauary 17 • UPDATE: the CAHNA Metting will be held at Norman Binkley Elemenatry School. CAHNA Meeting, Election of Officers, Breakfast. Breakfast at 9:00 AM, Meeting At 10 AM, Dues are due. CAHNA Election, Speakers fron YWCA Domestic Violence program and a neighbor from the community garden located at Blackman & Edmonson Pike. William Whitfield, just before Ellington Agricultural Center and the Edmondson Pike Library, is the nearest drop off point to our area. Website by Chris Jarvis of Caldwell-Abbay Hall © .